Ticketingbox system is designed and developed with cutting edge technology for automation of ticketing with unrivaled delivery speed and ease of use. 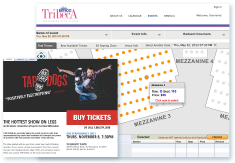 It is a fully integrated system built to maximize revenues with efficient ticketing process, powerful marketing tools and dedicated full-service call center. Multiple systems are confusing. We offer a complete solution. Along with the ticketing basics, the system supports multilingual interface for major languages. The competition is on, so you’ll need all the right tools to create blue oceans. Set up once, sell everywhere. Once an event is set up, its tickets can be sold through all available channels—online, at the box office, kiosks, or ticket outlets, and delivered as physical ticket, E-Ticket, or Pass in the Apple Passbook or Android PassWallet. Our built-in patron CRM is powerful yet easy to use. This is the central gateway for ticketing, marketing, fundraising, and customer service. A systematic approach to successful campaigns. Everything you send out or display is trackable through our real-time analytics tools. Nowadays, you’ll want everything at your fingertips. All major functions of the system are optimized for mobile—tools you can control at the tap or swipe of a fingertip. We won’t sell you a ticketing system, and then have you struggle with it. Our dedicated support teams will work with you hand-in-hand on any issues you may have. A sales representative will be in touch with you once we receive your information.